The new update delivers some major new features: the Client+ role, an integration with Slack, and a custom date range for reports. 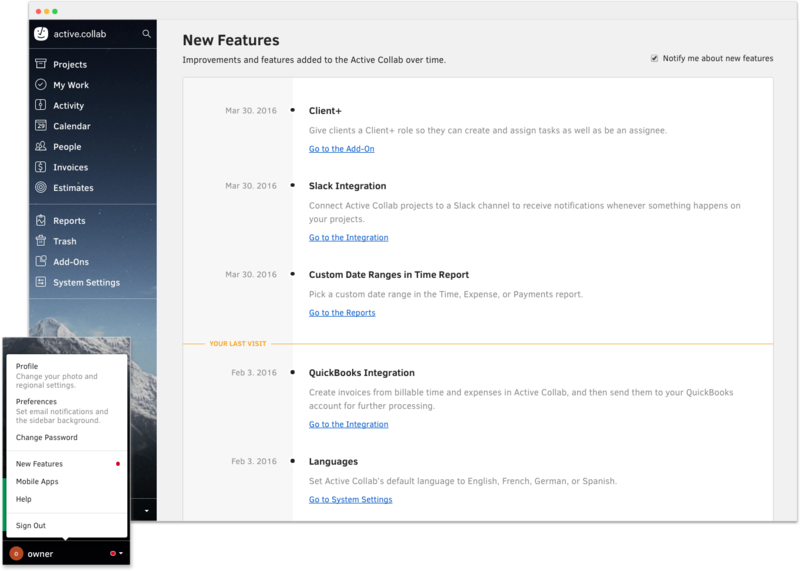 Also, we’ve added a New Features section right inside ActiveCollab so you never miss a big update like this one in the future. Collaborate even more closely by giving your clients the new Client+ user role. Then they'll be able to create and assign tasks, and you'll be able to assign tasks to them. They won't be able to see hidden tasks and other items in ActiveCollab, so everything else works as usual. This is for people who want to give more control to their clients so they can, for example, set new tasks themselves (instead of emailing the project manager and asking to fix an issue). You can also assign a task to your clients, for example, when you can't continue without their input. You can assign the Client+ role once you activate it in the Add-Ons section. 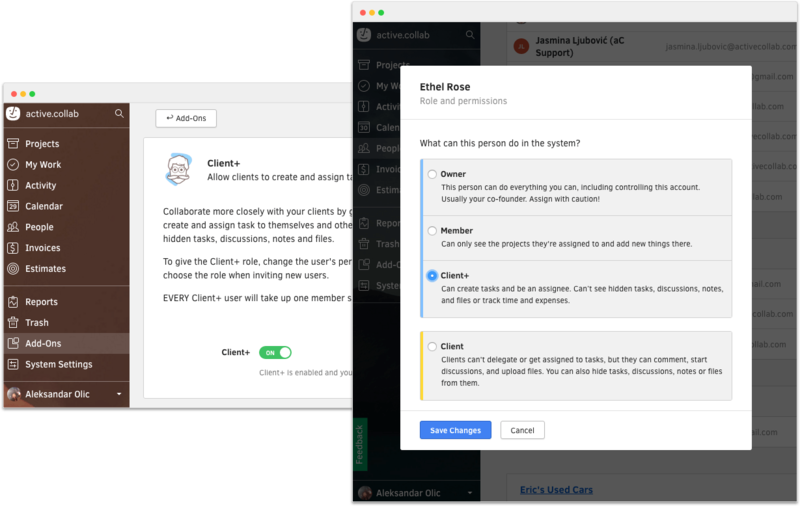 Note that each Client+ user takes up a seat in your cloud plan, just like the Owner and Member roles. So if you're on 5 member cloud plan and have 2 available seats, once you give a client the Client+ role, you'll only have 1 seat left. All you have to do is activate the add-on, select which projects to include, and the Slack channel where the notifications will appear. This integration uses our improved webhooks, which you can also use for developing your own solutions and integrations. A friendly word of caution: once you activate this add-on, you'll start receiving a lot of Slack notifications. 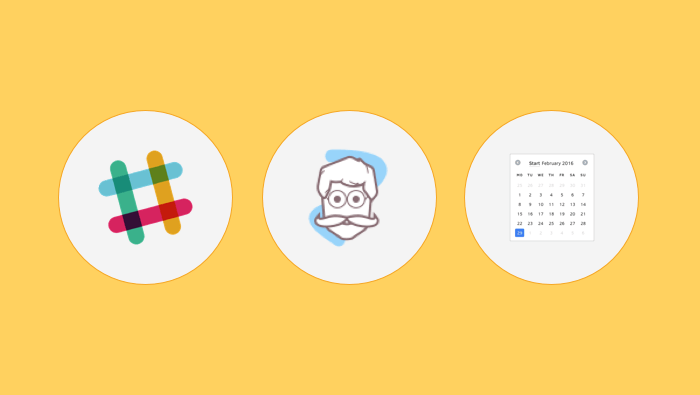 We definitely suggest you make a separate Slack channel for updates only (so you don't get overwhelmed). Now you can select custom dates for Time, Expense, and Payments reports. You'll notice a small red dot next to your name in ActiveCollab. It'll appear whenever we introduce a new major feature or improvement. This way, you'll always know when something big happens in ActiveCollab.